Soot is normally something you think of at the bottom of your chimney, but it also gets into the air, and scientists have been finding it at the frozen Arctic. Soot gets into the air when fuel, vegetation and firewood are burned. When you watch the smoke and soot drift away from your chimney, you normally wouldn't think that it would drift to the North Pole and change the ice and snow there. 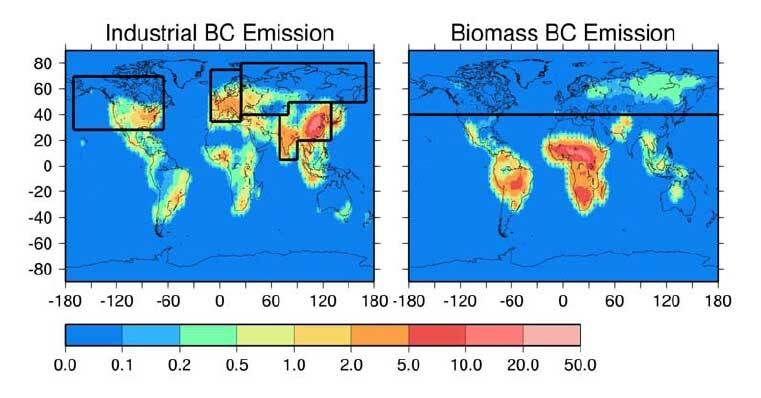 NASA has been exploring how black carbon or soot affects the Earth's climate, by using satellite data and computer models that recreate the climate. New findings show that soot may be contributing to changes happening at the North Pole, such as increasing melting of sea ice and snow and warming atmospheric temperatures. Dorothy Koch of Columbia University, N.Y. and NASA's Goddard Institute for Space Studies (GISS), New York, and James Hansen of NASA GISS are co-authors of the study that appeared in a recent issue of the Journal of Geophysical Research . "This research offers additional evidence that black carbon may have a significant warming impact on the Arctic," Koch said. Warmer temperatures in the Arctic mean melting ice and snow, among other things. 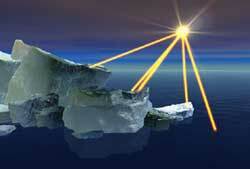 These temperature and ice changes also wind up affecting climate patterns around the world. The Arctic is especially vulnerable to pollution. In recent years the Arctic has significantly warmed, and sea-ice cover and glaciers have diminished. Likely causes for these trends include changing weather patterns and the effects of pollution. 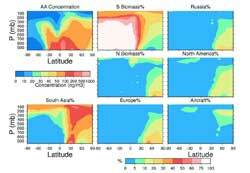 Airborne soot also warms the air and affects weather patterns and clouds. Black carbon has already been implicated as playing a role in melting ice and snow. Basically, when soot falls on ice, it darkens the surface and accelerates melting by absorbing more sunlight than ice would, just as wearing a black shirt in the summertime makes you feel hotter than if you wore a lighter color. Dark colors absorb heat and light, and lighter colors reflect it keeping surfaces cooler. Koch and Hansen used a NASA computer model and information gathered by many NASA satellites to get their finding. 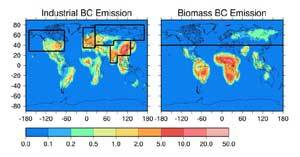 The research found that in the atmosphere over the Arctic, about one-third of the soot comes from South Asia, one-third from burning biomass or vegetation around the world, and the remainder from Russia, Europe and North America. South Asia is estimated to have the largest industrial soot emissions in the world, and the meteorology in that region readily sweeps pollution into the upper atmosphere where it is easily transported to the North Pole. Meanwhile, the pollution from Europe and Russia travels closer to the surface. During the early 1980s the main sources of Arctic pollution are believed to have been from Russia and Europe. Both of those areas have decreased their tiny particles of pollution in the last 20 years, but the pollution from South Asia has increased. 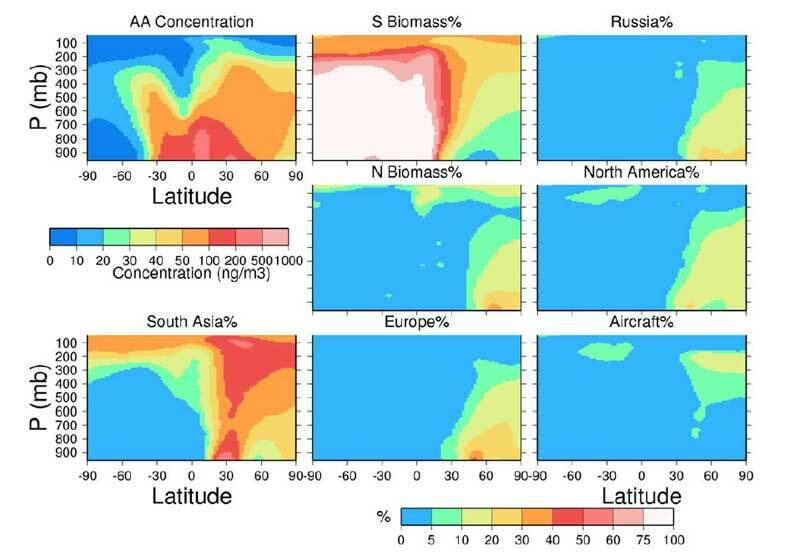 Koch and Hansen suggest that Southern Asia also makes the greatest contribution to soot deposited on Greenland. By exploring processes in the Earth's atmosphere, NASA scientists are seeking answers to how pollutants like soot are changing the climate of the world around us. Koch, D., and J. Hansen 2005. 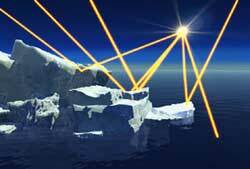 Distant origins of Arctic black carbon: A Goddard Institute for Space Studies ModelE experiment. J. Geophys. Res. 110, D04204, doi:10.1029/2004JD005296. This page was originally prepared by Robert Gutro as a NASA portal Environment news feature. See also the related NASA News Release.